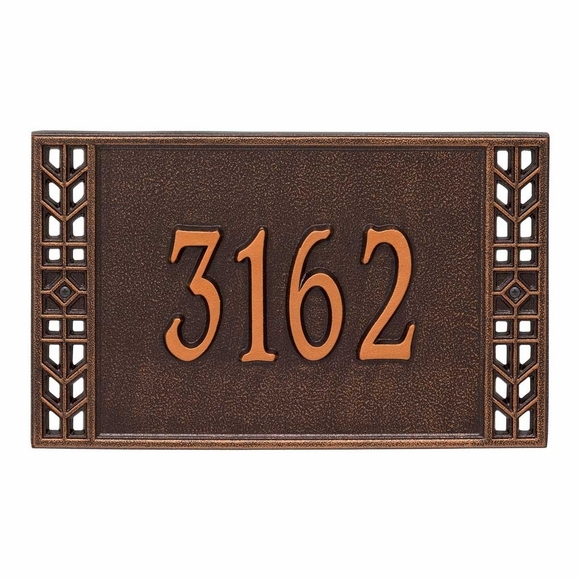 Address Plaque with Mission Style Border - - that enhances the traditional rectangle shape. Large 16.5"W x 11"H personalized sign. Wall mount. Made in USA. Holds a one-line or two-line address. The two-line sign holds up to five (5) 4" characters on Line 1 and up to thirteen (13) 1.25" characters on Line 2. For a one-line sign, please leave the Line 2 input box empty. Colors: AC antique copper, BG black/gold, BS black/silver, BV bronze/verdigris, OB oil rubbed bronze, and OG bronze/gold. Large image color: antique copper. Smaller images (from left to right): antique copper, black/gold, black/silver, bronze/verdigris, oil rubbed bronze, bronze/gold. Dimensions: 16.5"W x 11"H x .375".